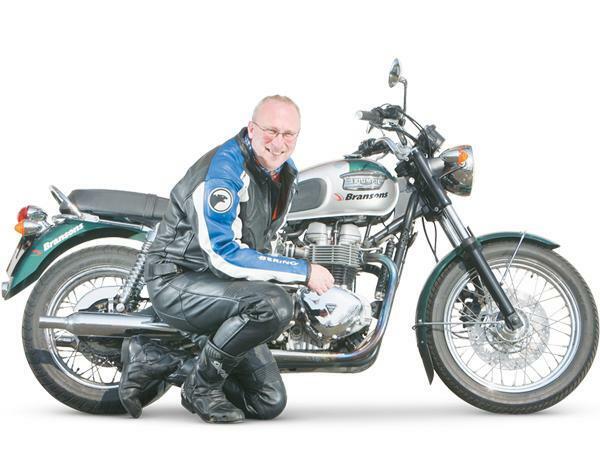 MCN's long term test 2001 Triumph Bonneville is in the care of British Superbike reporter Gary Pinchin. Find out how he has fared with the retro machine so far with his first three reports below, and follow the link, right, to see machines owned by MCN readers which are inspiring him at the moment. “I’m a Harley man at heart, but the Bonnie has hit a nerve. In an ideal world I’d have a Thruxton but there’s still plenty of scope to modify the stock Bonnie into the bike of my dreams. “Firstly the pipes look and sound shite so it needs an aftermarket system. The seat looks shite, too, so I’d like to replace it with one of the Seventies look-alikes you can get. And the bars are terrible. The normal Bonnie bars are way too narrow, so they need changing for some nice, droopy wide things. “I’ve got some serious riding planned, too. I’m aiming to do a specific trip with the Bonnie each month to things like the Coupes Moto Legende at Dijon in May and the Rock and Blues Custom Show near Derby in August. But biggest of all, if I can manage it, will be the Wild Viking Rally, in Hango, Finland. Why? Simply because I’ve never been, it’s not that far away, and there’s a different and amazing biking culture of clubhouses, parties and awesome bikes (and women). Did I mention it’s a great ride too? I’m dead chuffed with my Bonneville – even though I’ve only had time to ride it to and from work since it was delivered last week! It’s uncanny how much it reminds me of my old Meriden Triumphs, even down to the throaty exhaust rasp - providing my memory still serves me… The Bonnie feels light, agile and has plenty of grunt – though it lacks the urgency of my ‘91 Sportster. But it doesn’t vibrate like a jack-hammer 883 either. Actually the Bonnie feels incredibly smooth (so it should with counter-balancers) and I’m really champing at the bit to get some miles on it. The only thing I did before riding was to ditch the aftermarket screen. I don’t care how much wind pressure would be taken off my chest or how much less fatigued I’d feel after a long ride - windscreens are for cars. The bike, kindly supplied by Bransons in Gloucester, is immaculate, and so it should be with just 4542 miles on it. I just find it hard to understand why none of the three former owners have wanted to spend more time riding it! Personally, I can’t wait to get to know her intimately. Report Three: I always thought Triumph got so close to capturing the spirit of the original T120/T140 Bonneville with their modern Bonnie. After clocking a few miles on my 2001 model nothing has convinced me otherwise. It’s a bloody nice bike to ride, but just misses the mark. My bike, a 2001 model with 4000??? miles on this clock from Bransons in Gloucester, is smooth and easy to ride but it lacks grunt and runs out of breath. Handling is okay but could be sharper and while the brakes work, lever feel is horribly mushy. There’s nothing about the Bonnie that really grabs me by the balls to excite like my old shed of Harley does (or even my old 70s Triumphs for that matter). But all it needs is that little extra something to give it real character. I want to get back home after a ride, grab a coffee and sit, listening to the exhausts pinging, reflecting on what great fun the old girl is on the open road and how gorgeous she is sat there in my garage! And I’ve found two men who can help! Tim and Oliver Cole established Moto Twin last year to cater for the growing number of Triumph owners who, like me, want that little extra from their Bonnevilles and Thruxtons. Not only can they provide a few horses extra and stronger brakes, they’ve got bits that will make her scrub up into a right little looker. I met Tim at Mallory recently and he pretty much summed up my feelings. “Triumph built it down to a price, rather like the old Suzuki Bandits were,” he said. “But it means that owner’s still have spare cash to personalise their bikes.” Moto Twin offer a complete catalogue of bolt-on goodies but there’s four major items that I reckon will transform my bike: Additions: Stainless steel, reverse cone slip-on mufflers, with the carbs re-jetted to suit, give 12bhp, produce a much fruitier note and look 100% better than the ugly stock pipes. Price £375 inclusive of VAT. An air injection eliminator kit (£19) will reduce the severe does popping and banging my bike has on the over-run. The air injection system is designed to ensure complete combustion of the fuel air mix. An 18-tooth front sprocket (£16.78) improves cruising speed and prevents hitting the 7,000rpm limiter during hard acceleration. EBC front disc and ‘HH” spec sintered pads improves braking efficiency by a claimed 18% - and Goodridge hoses get rid of a mushy feel at the lever. Kit, including fluid £188. Hopefully we’ll have everything fitted by the time I ride to France for the Coup Moto Legendes classic festival at Dijon circuit later this month. A brief spin on Tim’s Moto Twin Bonnie revealed how much potential can be unleashed. The motor has much more urgency than mine thanks to the pipes and air injection eliminator kit. And it sounds absolutely great - not excessively noisy, just fruity – and there’s no hint of a burble on the overrun. The EBC front brake (same 310mm diameter as stock) and Goodridge hose give much more bite but the Progressive forks springs and Hagon shocks (15mm longer to jack the rear up) give a much firmer, even harsh ride – but Tim did have the bike set for two-up riding. Moto Twin’s Bonnie is gorgeous, making mine look a right old stodge. Period paint, shorter rear mudguard, jacked up rear end and black rubber fork gaiters give the bike a cleaner, more aggressive look – just like the original Bonnies. To see the reader bikes which have inspired Gary, click here. Products advice: Will an 09 Bonnie pipe fit an 03 bonnie?